This autumn could provide an interesting shake up of the Apple vs. PC debate which has been raging for decades as both Microsoft and Apple unleash their new Operating Systems in to the world. Windows 7 is due for release on the 22nd October however Apple announced on Monday that the release date of OS X ‘Snow Leopard’ had been bought forward from early September to Friday 28th August – the publication date of this column. After covering the release candidate of Windows 7 some weeks back I will this week attempt to cover the Apple offering. I don’t own a Mac or the developer version of Snow Leopard and, as such, the overview will be a culmination of what is known by the community so far which, owing to the usual Apple intense secrecy, is relatively little. It would appear that Apple hasn’t concentrated so much on adding new features to the Operating System than refining the underlying code. Installing ‘Snow Leopard’ on to a system currently operating ‘Leopard’ for example will immediately free up 6GB worth of disc space. A great deal of this space has been saved by the OS no longer offering support for the older PowerPC processors and, as such, you will need a more modern Mac utilising an Intel processor to make the switch. How much of the space saving has come from Apples claim that it has refined 90% of the Leopard code and how much of it is down to the removal of the PowerPC code we don’t know. The refinements that Apple have made have also resulted in users of the developer preview edition already in circulation reporting a faster installation along with a more speedy start up and shut down sequence. Apparently the OS also feels my punchy and responsive than previously. 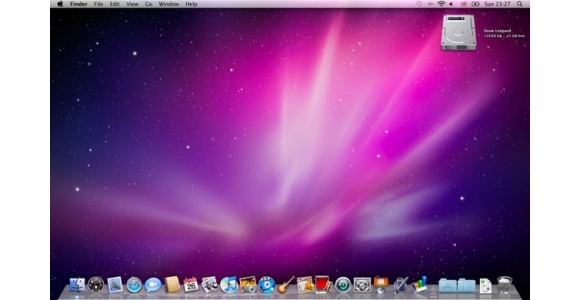 With Snow Leopard, Apple has successfully made the jump to 64-bit computing; a technology that is rapidly becoming standard in both the PC and Mac world. Practically all the bundled applications have been rewritten to take advantage of a 64-bit processor if available and this can potentially result in some pretty impressive speed increased. As an example, the 64-bit version of the Safari web browser is claimed to be up to 50% faster than the same 32-bit version. Power – Waking up from sleep mode is twice as fast with an additional speed increase of up to 50% when subsequently searching for a wireless network. Improved power management also means that if you are sharing files across a network then your computer won’t disconnect all users from your drive when your computer enters sleep mode. Quicktime – The bundled media player has been updated with a cleaner interface, easier uploads to YouTube and additional features previously only supplied in the paid for professional version. Finder – This search facility is now responsive and includes an enhanced icon view along with more customisable search options. Services – The services menu which allows you to make use of a specific service provided by another application installed on your hard disk will now only show you services relevant to the application you are currently using. Stacks – Dock items that give you fast access to a folder or files are now scrollable so you can easily view all items. Exposé is also refined so you can just click and hold an application icon in the dock in order to unshuffle all the windows for that application so you can quickly change to another one. As a final point, it should be noted that the upgrade version of Snow Leopard is priced at just $29.99 (around £20) making it a worthwhile upgrade for all Mac users. Although Macs are undeniably more expensive to buy and purchase accessories for, this price point looks incredibly appealing compared with the anticipated £70 price point of Windows 7 Home Premium.